Race relations are always a significant issue in American public life. Recently, events in Charlottesville have added a presidential dimension to the discussion. “How big a problem is racism in our society today? Is it a big problem, somewhat of a problem, a small problem, or not a problem at all?”. It’s important to remember that these statistics only tell us about people’s perceptions of racism as a social problem – they don’t record actual instances of racist behaviour or attitudes. But they still paint an interesting picture of race relations in the US. FactCheck looks at the figures. 2011 saw the largest proportion of people on record declare that racism is “not a problem” in answer to the poll question: “How big a problem is racism in our society today? Is it a big problem, somewhat of a problem, a small problem, or not a problem at all?”. At that point, 8 per cent of respondents said it wasn’t a problem in America, while a further 16 per cent said it was a “small problem”. 2009 saw the greatest combined total of respondents answer either “not a problem” or “small problem” – with 26 per cent picking one of those answers. That total figure has declined in the 2010s, and is currently lower than it was when comparable records began in 1995. 58 per cent of respondents said that racism is now “a big problem” in the US, up from a record-low of 26 per cent in 2009. In 1995, that figure was 48 per cent. 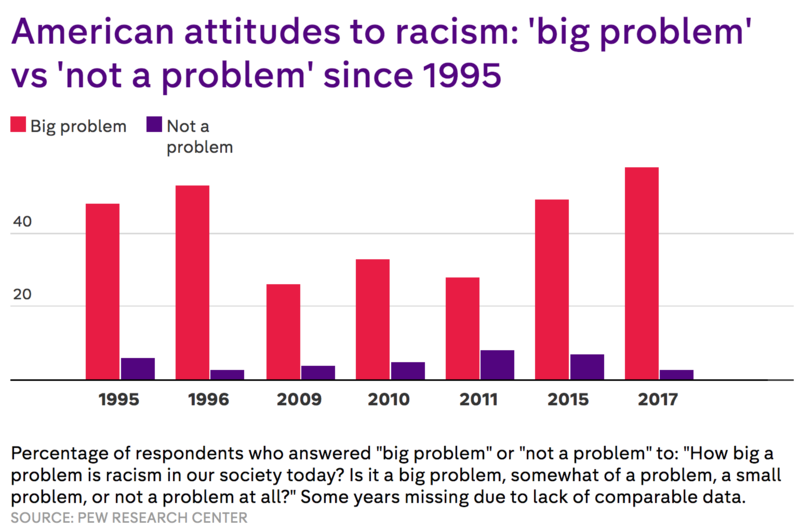 The total number of people who said that racism was either “a big problem” or “somewhat of a problem” has a followed a similar trajectory: dip in the early 2010s followed by increases in the last two years. 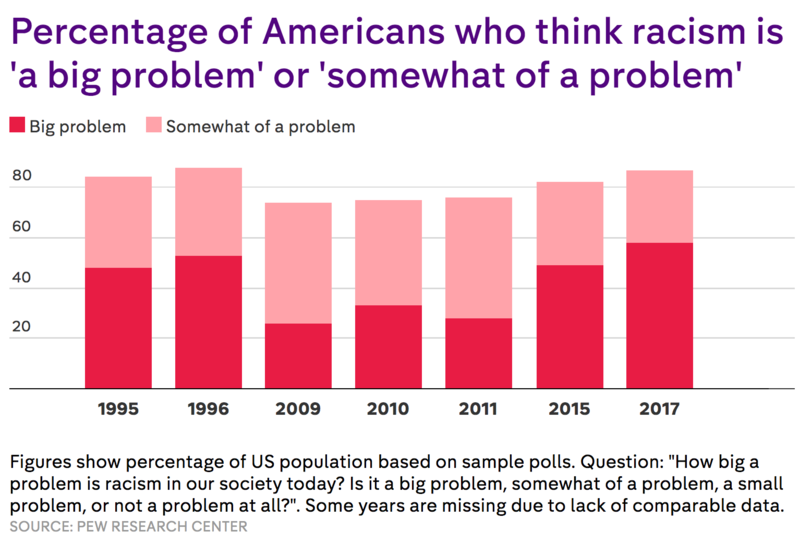 The number of Americans who think racism is “a big problem” has always outstripped the number that don’t think it’s a problem by a considerable margin since records began in 1995. The smallest gap on record was in 2011, when the gap was just 20 percentage points. But 2017 saw the largest gap – about 55 percentage points. 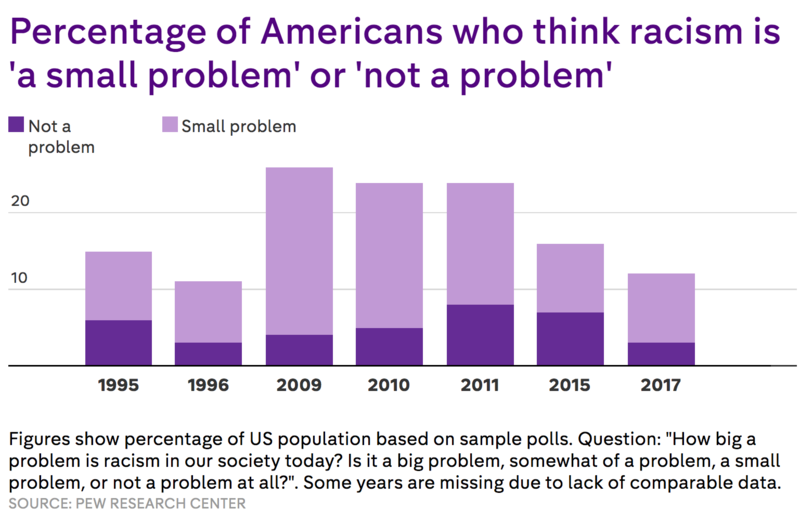 That means the number of Americans who think racism is a big problem outnumber those who say it’s not a problem by nearly 20 to 1. And the results present a mixed picture. If we group the “favourable” answers (i.e. those who answered “strongly support” or “somewhat support”), perceptions of the movement seem to have got worse since 2016. In 2016, the combined total of these two answers suggested 60 per cent of Americans were favourable towards the movement; the equivalent figure in 2017 is 55 per cent. Similarly, the proportion of those who “somewhat” or “strongly” oppose the movement is up from 31 per cent to 34 per cent. But when we break the figures down further, it’s not clear whether that’s a fair assessment. 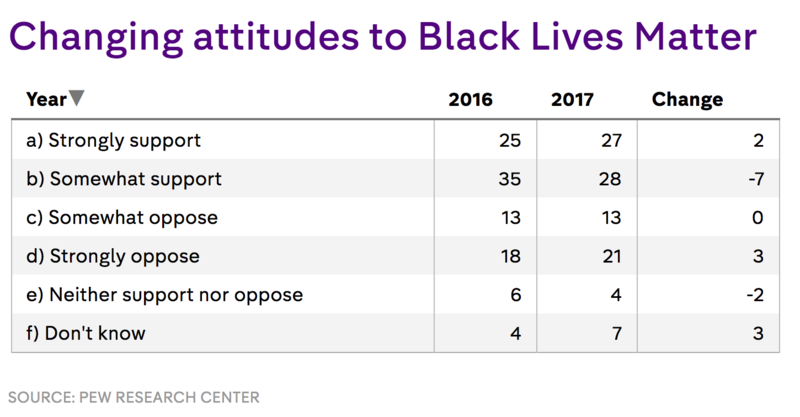 The proportion of people who say they strongly support Black Lives Matter has actually gone up by 2 percentage points since 2016. 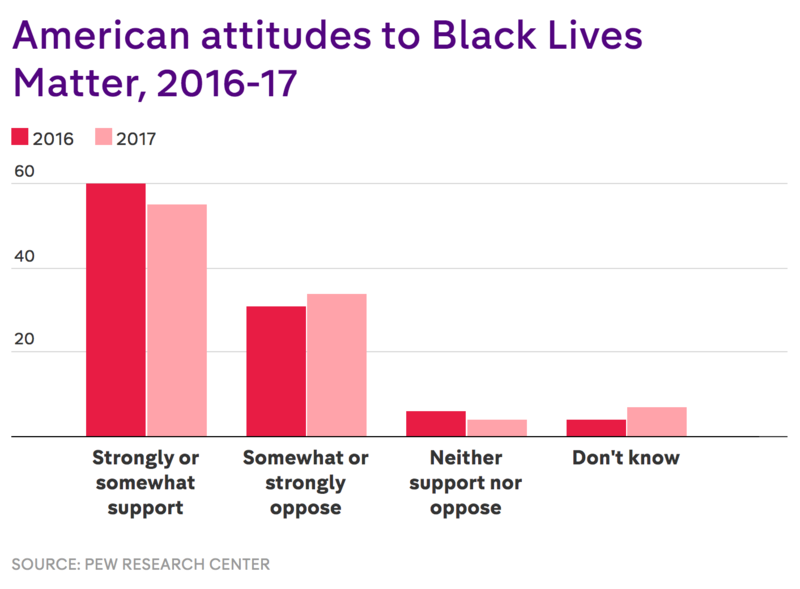 We can also see that those who say they “don’t know” how they feel about Black Lives Matter is up by 3 points on last year. One thing that is striking from the information we have is that it suggests perceived racism was especially low in the early days of Barack Obama’s presidency. It’s possible that having just elected the first African American president, some Americans felt that US society was moving away from the racism and discrimination of the past. But we have to be careful to avoid confusing cause and correlation. We simply don’t know why perceptions of racism have followed this pattern since 1995 – however tempting it is to draw conclusions.